This Plugin helps the Admins to have a clean database of local records. With this Plugin you can easily remove cheated records. Just type "/rmcheat" and select the cheated local records to delete. See screenshot for details. Introduced with XAseco/1.10 you can also use "/admin delrec [N]", so this Plugin is in effect just an GUI for that command and saves "only" many typing for the (Master)Admins. Last edited by undef.de on 21 Jul 2016 19:45, edited 19 times in total. Alright... so what does this do except allowing admins to arbitrarily remove recs easier than via using rcp or nouseforaname's webscript..? Why not just update your dedserver and xaseco version, and allow the built-in checks to take care of the cheaters..? Nice GUI, but the way you're deleting table entries creates not one but two inconsistencies between the 'records' and 'rs_times' tables, which can result in problems later. You should really use the /admin delrec command to avoid that. Last edited by Xymph on 29 Oct 2009 12:13, edited 1 time in total. Xymph wrote: but the way you're deleting table entries creates not one but two inconsistencies between the 'records' and 'rstables' tables, which can result in problems later. Did you mean 'rs_times' instead of 'rstables'? The deletion of the records was taken from the command "/admin prunerecs" with some changes, so is there the problem too? And I did not understand how my deletion can create inconsistencies with the tables. After deletion I call the function ldb_newChallenge() to rebuild the complete record_list. So there is (my opinion) no possiblities to create inconsistencies between the tables. Xymph wrote: You should really use the /admin delrec command to avoid that. The changes will be done today. undef.de wrote: Did you mean 'rs_times' instead of 'rstables'? undef.de wrote: The deletion of the records was taken from the command "/admin prunerecs" with some changes, so is there the problem too? The changes are what cause the problems in your plugin, for instance deleting only one entry from rs_times for the pertaining player and track, instead of all of them. undef.de wrote: And I did not understand how my deletion can create inconsistencies with the tables. After deletion I call the function ldb_newChallenge() to rebuild the complete record_list. So there is (my opinion) no possiblities to create inconsistencies between the tables. ...but that should address them. I've explained these problems several times before in threads about my repairrecs.php script and the various web scripts that also clean up records, so I'm not going to rehash that. Xymph wrote: I've explained these problems several times before in threads about my repairrecs.php script and the various web scripts that also clean up records, so I'm not going to rehash that. I have changed my Plugin and now the combination is perfect. Can you please help me edit! 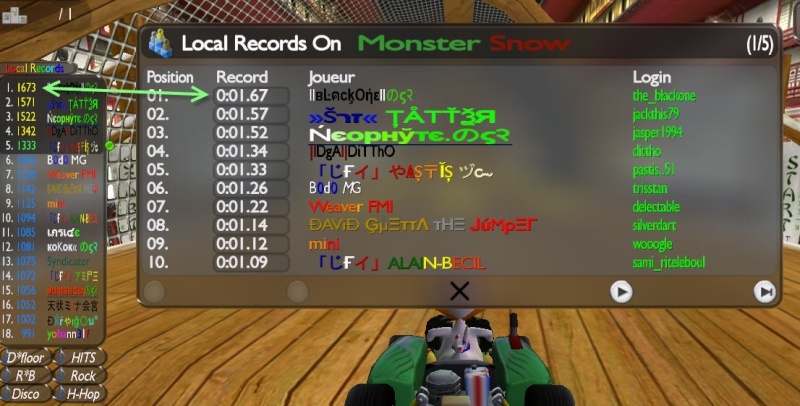 This plugin displays not correctly score points in stunt mode! Which line should I change please? Last edited by Pastis on 27 Aug 2010 20:18, edited 1 time in total. Pastis wrote: Can you please help me edit! I will release shortly a fixed version of this Plugin... please wait.